Heat oven to 475°F. Brush large cookie sheet with 1 tablespoon of the oil. In 10-inch skillet, heat 2 tablespoons of the oil over medium heat. Add onion and garlic; cook 1 to 2 minutes, stirring occasionally, until onion is tender. Stir in beef; cook 8 to 10 minutes, stirring occasionally, until beef is thoroughly cooked; drain. Reduce heat to medium-low. Stir in tomato, chiles, taco seasoning mix, applesauce and raisins; cook 10 minutes, stirring occasionally. Stir in almonds and olives; cook 1 to 2 minutes or until thoroughly heated. For each chimichanga, spoon 1/2 cup beef mixture down center of each tortilla. Fold sides of each tortilla toward center; fold ends up. Place seam sides down on cookie sheet. Brush tops and sides of chimichangas with remaining 1 tablespoon oil. Bake 6 to 8 minutes or until golden brown. Cool on cookie sheet 5 minutes. Meanwhile, in small bowl, stir sour cream, green onions and 2 tablespoons of the cilantro. 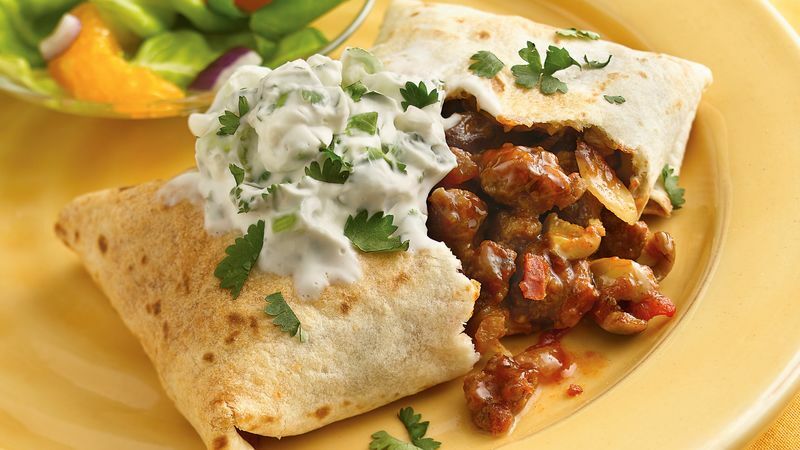 To serve, top each chimichanga with 2 tablespoons sour cream mixture and remaining cilantro.